PLEASANT POINT / SIPAYIK! 1900! 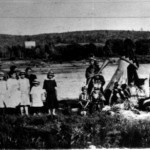 Wide view photo in our collections of the Passamaquoddy community at Pleasant Point / Sipayik in Maine. 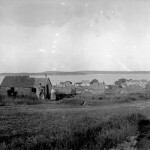 Photo dates to about 1900. 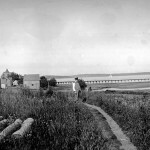 Deer Island, New Brunswick is in the background. SIPAYIK! PLEASANT POINT! 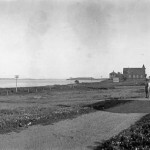 C.1900! 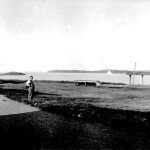 Panorama photo from a negative in our collections of the Passamaquoddy community at Sipayik / Pleasant Point, Maine in about 1900. An earlier Catholic Church building with its peak roof can be seen in the center left and a railroad trestle bridge can be seen to the center and right. Deer Island, New Brunswick is in the far distance with the waters of Passamaquoddy Bay before it. SIBAYK! PLEASANT POINT VILLAGE! 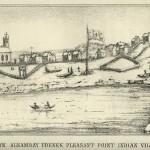 Here’s an early view of Sipayik, Pleasant Point (Passamaquoddy) Village from a book in our collections. The book is a prayer book made by Jesuit priest, Eugene Vetromile, and published in 1857.